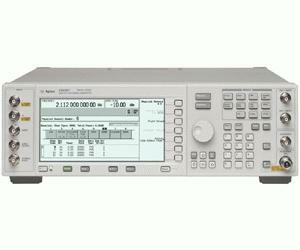 Selecting Option 502 for the E4438C ESG vector signal generator provides a 250 kHz to 2 GHz frequency range. Five frequency range options are available to choose from, extending from 1 GHz up to 6 GHz maximum carrier frequency. This provides ample resolution to configure the ESG to meet your specific test requirements. The 250 kHz to 2 GHz frequency range, combined with the advanced internal baseband generator, provides an economical alternative to configure the ESG as a high-performance arbitrary waveform generator and real-time I/Q symbol builder. This enables the creation of benchmark test signals at baseband and RF frequencies up to 2 GHz. Option 502 is recommended for test cases that require baseband and RF test signals at or below 2 GHz carrier frequency. Common uses include test stimulus generation for various components used in wireless communications systems transceivers, such as ASICs, DSPs, ADCs, DACs, up/down converters, filters and power amplifiers. In addition, the 2 GHz frequency range enables the generation of receiver test signals at low- and mid-band cellular frequencies, including W-CDMA, cdma2000, and GSM.